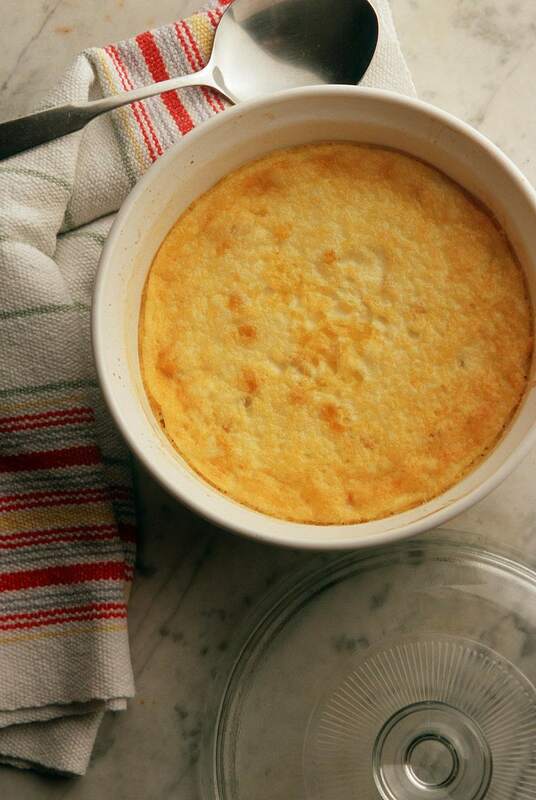 This corn custard recipe is light but still rich and satisfying. It makes a wonderful side dish for all kinds of meats. Since the custard is soft and creamy, texturally, it makes a great match for things like barbecue pork, grilled steaks, and fried fish. Combine the corn, cream, milk, salt, and cayenne in a large saucepan. Bring the mixture to a simmer over medium heat, stirring often. Remove the pan from the heat and let the mixture cool slightly. Carefully pour the mixture into a blender and puree until very smooth. Set aside. Preheat oven to 325 degrees F. Butter six 6-ounce ramekins and place them in a 9 - by 13-inch baking dish. Combine the eggs and egg yolks in a large bowl and whisk for 30 seconds. Slowly add the warm custard mixture to the eggs, 1/2 cup at a cup at a time, stirring until blended. Ladle the mixture into the prepared ramekins. Pour hot tap water into the baking dish to come about halfway up the sides of the ramekins. Bake for 30 to 35 minutes, or until the corn custard is just set. Remove the ramekins from the water in the baking dish and let cool for 10 minutes before serving. You can eat the corn custards right from the ramekins, or you can unmold and serve on plates. To unmold, run a knife between the custard and the ramekin to loosen, and invert over onto a plate. • You can add a little more flavor to this recipe, by roasting the corn first. Spread the corn in a singel layer on a baking sheet and roast in a 350°F oven until golden brown, about 15 to 20 minutes. Prepare the recipe as directed. • If you are using fresh corn for this recipe, the best way to remove corn kernels is to stand the ear of corn on its end in a shallow bowl and using a sharp knife, cut the kernels from the cob. For dishes where you'd like more corn flavor, such as this creamy corn custard, after cutting off the kernels, reverse the knife so you're using the dull side and press it down the length of the ear to push out the rest of the corn and its milk. Recipe edited by Kathy Kingsley.